What is the Yark? It has been likened to the Gruffalo. He is a big and hairy beast, has jagged teeth and long fangs, and loves to eat children. But his stomach can only digest very good children, for ‘liars give him heartburn and bullies and brats damage his teeth’. There are not enough such children to keep the Yark in this story well fed, so he must find ways of discovering their whereabouts to keep him from starvation. He steals Santa’s list of good children and sets off to find them. Charlotte is at the top of the list, and when he arrives at her home, she fools him into thinking she’s bad. She even has a handbook on how to protect herself from Yarks. Then Jack the bad brother gets mistaken for Lewis the good one, and is gobbled up. This makes the Yark very ill. He is convinced he will now die of poisoning. The Yark awakes to find himself in a warm bed, being cared for by Madeleine in an abandoned lighthouse. She slowly heals him with care and herbs. Madeleine neither feels fear or repulsion for the ugly Yark. In fact, she finds him beautiful and fears for him. When the wild thing is faced with these unknown feelings, he’s unable to react. He sees his next meal before him but cannot bring himself to take the final step. Can love change a wild beast? This divinely illustrated book in detailed, fine-line black ink art presents full page images of the text. The language is expressive and melodic. 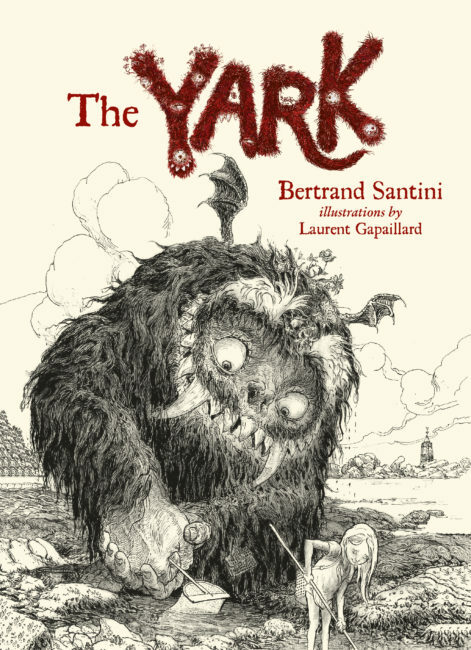 Santini’s use of words and rhyme, tastefully scattered with assonance and alliteration, add beauty and elegance to a seemingly bizarre choice of subject for a children’s book. Translated from the French language, the poetic nuances of the original language seep through. Themes of beauty being in the eye of the beholder, good conquering evil, kindness obliterating terror, and the warring of the senses, are demonstrated through the monster’s struggles with his needs, versus the healing powers of Madeleine’s love and friendship. There are underlying messages within the book’s contents. Through the predilection of the monster’s food and its scarcity, a clever reference seems to be made to the contamination of modern life, and the loss of traditional manners and social skills. This book is perfect for book collectors and lovers of unusual children’s books.